The Klotz D-Sub 25p. 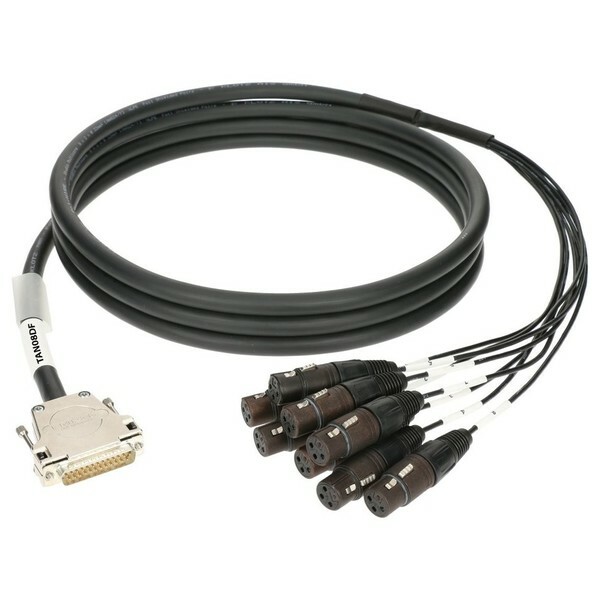 Male - 8x XLR Female, 1m is a high-quality breakout cable designed for use with AES and analog audio equipment. The highly flexible cable features XLPE insulation (cross-linked PE). It is suitable for use with Tascam Mackie Yamaha and Focusrite equipment with a D-Sub connection. The pin output adheres to the AES59 standard, and the cable includes additional screws for Yamaha compatibility. The cable features a D-Sub male connector, feeding into eight Neutrik XLR female connectors. The Klotz D-Sub cable is perfect for use with Tascam peripherals such as recorders, interfaces and rack gear. Although it is optimised for Tascam products, the cable is also ideal for use with equipment from Yamaha, Mackie, Digidesign and Focusrite. The cable is produces via PolyWIRE studio multicore bulk cable, providing optimal signal integrity and audio performance. The cable features a D-Sub connector feeding to eight Neutrik XLR (female) connectors. The XLR connectors are encased in an ultra-strength, self-extinguishing woven sleeve. The outer material features a transparent design for labeling. It also provides a generous 0.22 m² conductor cross-section and low 85 pF/m.